I'm so excited! This is my first attempt on this jelly mooncake..a complete set with jelly egg yolk and filling. I know, a lot of works need to be done but it's OK! As long as I enjoy the whole process I think it worth though...he he! It's not an easy job after all. Everything must be calculated accurately and have to make sure the jelly wasn't too soft nor too hard. I've bought a few jelly mooncake moulds. Really pretty! Wait..I'll show you later. - combine coconut milk, custard powder and colouring together and mix well. - combine water, sugar and agar-agar powder and bring to boil, stir well. - add in coconut mixture and cook untill thicken. - off the heat and pour into the mould. - leave to cool and then keep in refrigerator for 30mins untill set. - remove jelly from the mould. - combine all ingredients and boil over low heat. - stir continuously untill thicken. - off the heat and pour into tart moulds and leave cool completely. - and of coz not to forget to place the jelly egg yolk in the middle. - then keep refrigerator for 30 mins. These are the moulds I mentioned about. There are lots of shapes and patterns. - combine water, sugar and agar-agar powder and boil over low heat. - stir continuously untill slightly thicken. - off the heat and add in the remain ingredients. 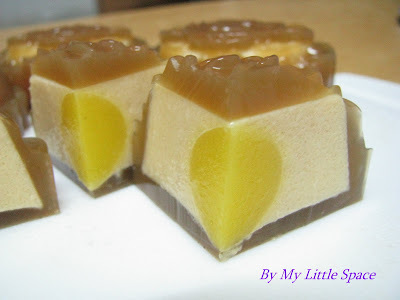 - pour the mixture to the jelly mooncake mould about 1/2 cup. 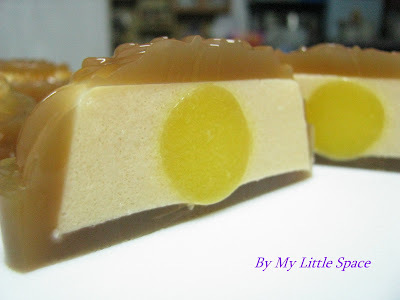 - place in jelly filling in the middle and cover with coffee jelly mixture. - leave to cool and keep in refrigerator untill set. A really satisfying result! 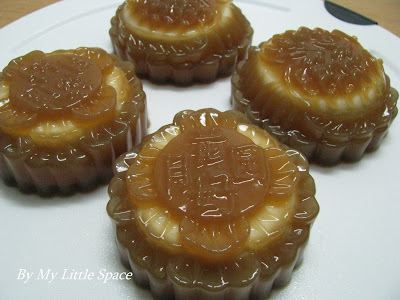 The jelly mooncake turned out beautifully.....and I'm dancing with joy...ha ha! Pretty??? Oooo...and it's really tasty as well. The outer layer skin is a little crunchy and the filling is soft like custard, you can really differentiate it! I guess this is another success trial....hip hip hooray...ha ha! So pretty mooncake. Good Job!! They are so special and even good for the summer. Anncoo : Welcome on board! That's very kind of you. Thank you so much. Angie : Thanks! Do you have the mould for this? Divina : Sure, will send over in a minute..he he he! H/Housewife : That's very kind of you. Thank you so much for your kind words! Juz having fun with it...Glad that you like it. You're so talented! I'm dying for mooncakes .. I'll have to go to an Asian market to get some before the end of the week! These look so beautiful. I have to get some before the week is out. Yay! What a nice job! You can see the love and care that went into these beautiful mooncakes! I really want to try one (I love coffee and the coffee flavor) he he. I am enjoying your mooncakes very much. Your photos are lovely. 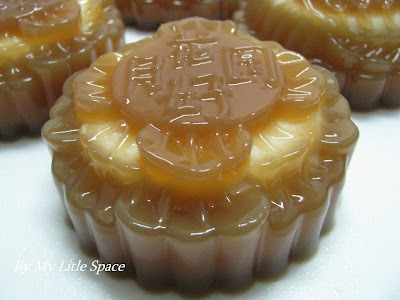 I love love love this..now all I need are mooncake molds. Barbara : Glad that you like it! Hopefully, you'll give it a try. Laura : Yeap, you better hurry up! The mooncake season going to end real soon. Mary : Thanks. Hope you enjoy the mooncake as well! Lyndsey : That's very kind of you. Thank you, thank you, thank you! Kathy : Good luck to you! Hope you'll get the moulds. I'm a mother of two and I am a homemaker. Cooking & baking are both my stress relief therapy. However, outdoor camping is another frequent activity of my life as well, with hubby.